We meet 6:30PM every Thursday. Please check Events for location. Please come out and support the Cub Scouts as they support us! It doesn’t get any better than this!!! $10 per person / $40 per family for all you can eat pancakes and sausages. 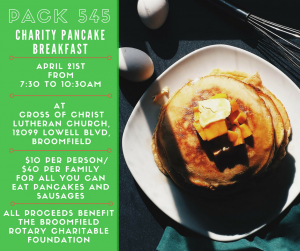 All proceeds benefit the Broomfield Rotary Charitable Foundation with half of the proceeds going to the Broomfield Marathon on Nov. 4th and the other half going to Precious Child.